Ice-white petals with orange anthers. Crocuses flower very early on in the season and are a sign that spring is on the way. 15 cm tall. 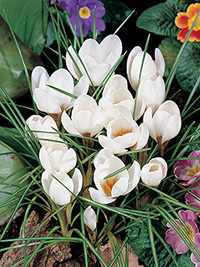 For maximum effect, plant crocuses in large clumps to ensure that they will be a standout in the garden. Plant bulbs 5-8 cm deep and 8-10 cm apart.